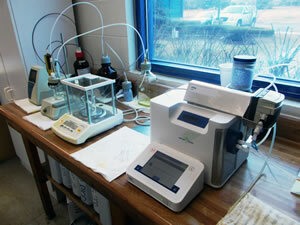 BVA maintains and operates a lubricant analysis laboratory in New Hudson, Michigan. This facility performs routine Quality Control, R&D, analytical and troubleshooting work. BVA also extensively uses specialized contract laboratories. Routine Quality Control analyses of lubricant physical and chemical properties include kinematic viscosity, total acid number, moisture level, foam testing, flash and fire point and pour point. Additional analytical methods that may be provided for new and used lubricants include, particle count, fourier-transform infra-red spectroscopy and spectrochemical analysis. Specialized tests for specific applications are also available. Tests for refrigeration lubricants include refrigerant/lubricant miscibility, sealed tube stability and pressure-viscosity-temperature relationships with specific refrigerants and materials compatibility. Trouble shooting methods may include gas chromatography coupled with mass spectroscopy, high performance liquid phase chromatography, and inspection of particle contaminants. BVAdvanced Products Division of BVA, Inc.
© 2019 BVAdvanced. All Rights Reserved.